For me, music has the most incredible ability to transport me to places I haven’t been in a long time. Different points throughout a lifetime, memories tucked away and nearly forgotten. You’re casually going about your every day and suddenly a song comes on. It’s like magic. You’re back in that moment where song and moment were linked together and emblazoned in your brain for the rest of your lasting memory. In my #31days31people gratitude project last December, I wrote a post about my friend Mike which included a link to a song. This song was from a mix-tape Mike had made for me to listen to when I ran. I stopped running in 2004. This song took me back there. When I heard it, it was like I was back in that time, running in the vast, empty desert. Feeling life and air and sunlight. Daniel’s writing is beautiful. I encourage everyone to check out this post, and if you’re prepared for an emotional journey, read the whole blog. Daniel’s post about “wormholes” has inspired me to explore my own music/song wormholes, and share them with you here. 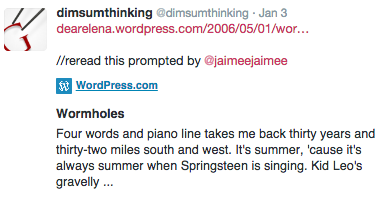 The goal is one brief post about one song per day, for each day in February, 2015. The hashtag is #wormholes. 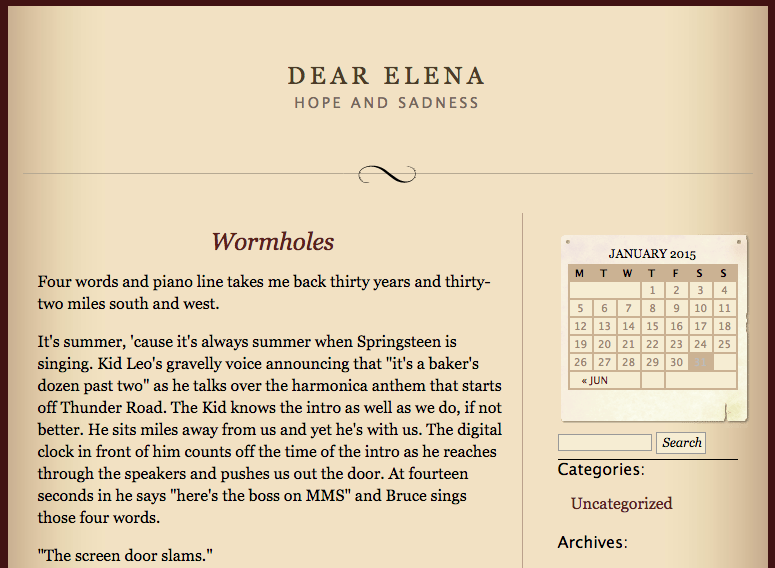 I hope you’ll join me on this personal journey through Wormholes by reading, or writing and sharing your own.